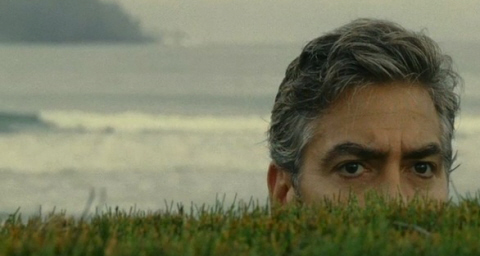 Time will tell if The Descendants is Alexander Payne’s best film. It feels like it is, but a film as personal and complex as this one needs time to grow – its themes and messages need time to marinate and mature within a viewer’s mind. Having not directed a feature film since 2004’s Sideways, it’s refreshing to have Payne back in theaters. A beautiful meditation on love, loss and regret – The Descendents leaves just as lasting an impression as its namesake would lead you to believe. This is a film about a tragedy, but it’s also about the hope we search for in such dispair. Its characters struggle to be whole in the face of a profound loss, one that brings about startling revelations. But what’s apparent from the beginning is that they were never whole to begin with. And only now, in the midst of all their mourning, can they finally realize that enough to accept the past and hopefully move on with their lives. Adapted from a 2008 novel by Kaui Hart Hemmings, the film focuses primarily on George Clooney’s character: Matt King. King’s fighting wars on two separate but intersecting fronts. He’s the primary trustee for ancestral Hawaiian land owned by his extended family. That trust expires in seven years, leading the family to want to sell the land and secure a large fortune. As this is happening, King is also coming to grips with the fact that his wife is never going to wake up from the coma brought about by a boating accident. When his daughter Alexandra (Shailene Woodley) reveals that the mother was having an affair, Clooney and family are forced to face some pretty heavy truths in the face of her impending death. If that synopsis leads you to believe that The Descendents treads on soap opera territory, please know that the film feels firmly grounded throughout – never threatening to amp up any heightened sense of melodrama. A good thing, given that the source material totally lends itself to such an approach had a lesser director taken on the project. Thankfully, Payne keeps his actors and his script in check. Both the characters and their emotions feel entirely genuine. Cinematographer Phedon Papamichael delivers breathtaking work. I think a large part of that comes with Payne and Clooney’s willingness to inject lightheartedness and comedy into the proceedings. Clooney seems to find comedy in even his serious roles (see Batman & Robin) and considering that Payne directed Election it’s obvious he’s no stranger as well. Part of the charm of a film like Descendents is its ability to make you laugh in one scene and cry in the next. When Clooney and his daughters decide to seek out the other man (Matthew Lillard, yes, that Matthew Lillard) in his wife’s life, it’s amazing the astute balance they’re able to walk in knowing when and when not to play for laughs. There’s also a lot of great character work in the film. Lillard is surprisingly effective in his limited screentime. Also leaving his footprint is the great Robert Forster, as King’s jaded father-in-law. Clooney obviously brings the goods, as he’s cemented himself as one of the most dependable actors in film today. His Matt King isn’t a bad guy, just absent. He’s been living life at work, oblivious to his wife or his daughters. Now he’s thrust into the situation of having to be present for his girls and, unsurprisingly, he doesn’t know how to cope. Clooney’s daughters in the film fare just as well. Amara Miller debuts as Scottie, the younger of the two. I love that she seems wise beyond her years in most respects, but still naïve and trusting enough to be in the dark as to what’s falling apart around her. Her older sister Alexandra, played by Shailene Woodley, is in many ways the exact opposite: immature, but so cynical as to come off more knowing than she really is. The greatest gutpunch of the film is the sense you get that any chance at a normal life may be dwindling away with their mother’s life. Shailene Woodley delivers a spectacular performance, the best of the film. Woodley’s performance is far and away the best of the film and took me by complete surprise. Alexandra’s journey is sorrowful, and the beautiful Woodley is so capable in the role that I can only hope more comes of it. She and Clooney thankfully do most of their work here together, and it’s the very heart of The Descendents. Their testy relationship feels nothing if not genuine and you’re left with the sense that these two, despite their differences, depend terribly on each other. The fact that Alexandra decides to bring her surfer boy toy Sid along for their trip is initially played for laughs. Nick Krause has the “dumb stoner” acting technique down pat here. But an aside with Clooney later on reveals that his presence may be something more profoundly heartening, and I found it to be the most affecting scene in the film. The final character I have to mention is that of Hawaii itself. Cinematographer Phedon Papamichael films every frame possible with the immense beauty and serenity of the Hawaiian landscape. The money shot of the film, when the King family visits their land, makes for a truly breathtaking landscape. Papamichael’s work here is a constant reminder of what the Kings stand to lose when they eventually sell their land. 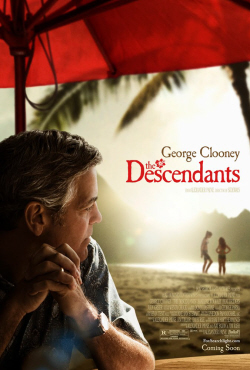 The Descendants finds its heart in Clooney & Woodley's scenes together. The film definitely drags in parts – whenever the script spins its wheels. An example of this would be in the scenes where Clooney reveals that his wife is going to die, and that there’s no saving her. There are four scenes I can remember where King unfurls this news on different people. I’m not of the opinion that each scene was necessary, or couldn’t have been condensed more. But whenever it picks up it does so splendidly. While I do feel the film would have felt tighter with a few minor cuts, it does not draw away from the whole. As it is, it’s an incredibly solid film with some minor fat that could have been trimmed. I can see The Descendents becoming a major force come awards time. Its performances are never showy or self-congratulatory – refreshing for a film released in a season typically noted for such things. It all amounts to a subtle film that leaves a very unsubtle impact: no one action, good or bad, can ever define a person’s legacy. That message won’t read any clearer than in the film’s final, hopeful moments. I don’t yet know if The Descendents is Alexander Payne’s best film, but it’s certainly my favorite.